Your terminal is a command-line interface to your hosting account on the server. It provides a quick, efficient means to make permission changes, edit files, and even run services like MongoDB and node.js. Terminal access is provided with certain qualified packages. 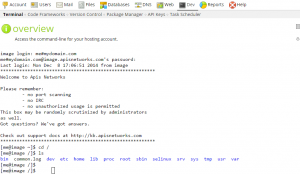 Assume your username is myadmin, domain example.com. 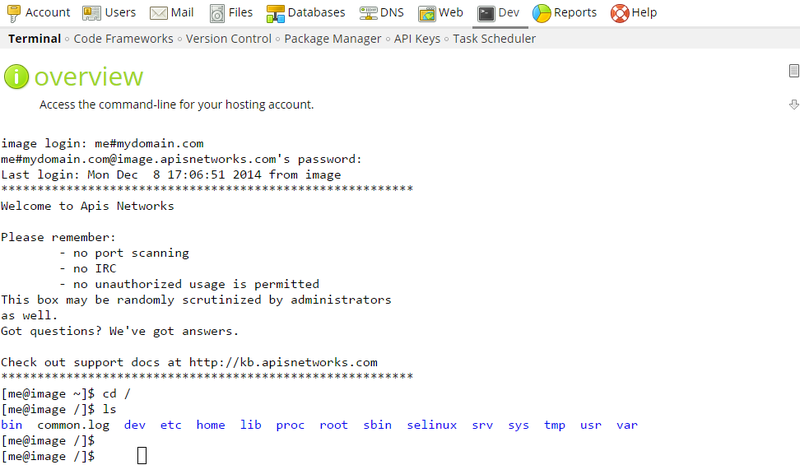 To login using the ssh program, the format would be ssh <login>@<host> or ssh myadmin#example.com@example.com. ssh myadmin@example.com@example.com would also work for newer ssh clients that properly interpret the command-line string. <username>#<domain> is used instead for illustrative purposes. Terminal access may also be accessed directly within the control panel under Dev > Terminal. Your login will be automatically filled-in. Just confirm with your password. Terminal interface available within the control panel. Logging in using the ssh command via Linux or OS X can be confusing! Typical login syntax is ssh login@domain. This is incorrectly applied as user@domain whereas it should be user@domain@domain. With a username “myuser” and domain “example.com”, the appropriate SSH login would be, via the ssh command, would be myuser@example.com@example.com. This entry was posted in Terminal Access and tagged ssh, terminal.